The Silver Y is a moth dear to many, as one of the commonest species in the UK in terms of being seen. It has the obliging habit of flying by day as well as by night, nectaring on brambles or willow herb and especially busy at dusk. I am fond of it in the same way as I am of the Red Admiral butterfly described yesterday and for the same reason. It is the first moth that I can remember. 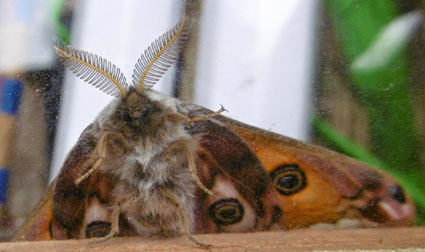 I can even recall winning approval during a brief schoolboy flirtation with classical Greek by pointing out how its Linnaean name, Autographa gamma, sees its shiny mark as a Greek G - gamma - rather than an English Y. Brainbox, eh? I was lucky to go to schools where natural history was strongly encouraged, much as environmental awareness is in classrooms today. Silver Y's come in a variety of sizes and shapes and can be confused (especially by me) with their relations such as the Plain Golden Y and the Beautiful Golden Y - famous misnomers as both are equally lovely. We know little if anything about the psychology of moths, but it must be irritating to be called Plain anything. Mind you, such treatment can prompt a determination to excel as in the case of the writer Edith Sitwell who was treated dismissively by her mother when young as 'Poor Little E' on account of her unflattering looks. We could apply it, I guess to the ageing and battered Silver Y in the third photo above, but he or she is most welcome as an illustration of how this moth can be found almost all the year round. That is all the more impressive because it is an immigrant whose larvae are not thought able to survive our winter. They must come over from the Continent in swarms. I've got three pictures of the next moth, the micro Pyrausta purpuralis, because it is such a lovely shade of purple, as its name suggests. Also because these are three different individuals, all together in the eggboxes, and they usefully show the small differences in patterning which can confuse the ageing human moth enthusiast in less distinctive species. And the funny little Mouse mouth which, true to its name - and the main reason for its name - scurried around for ages before settling long enough for me to take this picture. Lastly, I was talking yesterday about the way that yellow underwings do themselves a dis-service by hiding their bright petticoats except when in flight or, briefly, if disturbed. Here is what they usually fail to show us, courtesy of a dead one whose wings are held open by two of our many curious mantelpiece objects. Sorry, my granddaughter and other animals have been distracting me from moths and the weather has also hampered trapping on several nights since I last posted. But today is lovely and sunny and so the Red Admirals have come out to play, one of the first butterflies I remember clocking as a child and one of the loveliest that the UK has to offer. As veteran readers of the blog have been reminded on several occasions, these admirals have nothing to do with the sea which laps our island shores. They are named through a gradual transition of language. Just as the Infanta of Castille, Hencry VIII's first bride Katherine of Aragon, became the 'Elephant and Castle' immortalised in the names of many pubs, so the 'Red Admirable' became the 'Red Admiral'. Both inaccurate versions are easier to say. ...the Thorn family has brightened up the rather dull assembly of rustics and yellow underwings which are the principal current harvest; above, two pictures of that fine creature the Canary-shouldered Thorn and one of an August or September Thorn (impossible for me to tell apart) on a house window near the trap. And the dashing Swallow Prominent has put in a similar appearance several times, choosing a wall rather than the eggboxes. Below are the afore-mentioned Yellow Underwings of various types. I got sick of them in Leeds where they came by the hundred. Here they are less common but currently plentiful; certainly the top visiting species in terms of numbers at the moment. Little Emily enjoys watching them fly away when we tickle them - a rare chance to get a glimpse of their bright yellow and orange petticoats. I also showed her the Pinocchio of the moth world below, the Snout with its protruding palps which resemble the tall-story-telling puppet's nose - albeit, on close inspection, with a fork at the end which would have made his embarrassment even worse..
Today is a record of curious places visited by moths and men. In the first case, here is a unusual lair for a Large Yellow Underwing: an unopened packet of miniature French Foreign Legionnaires and their Bedouin opponents. As our long, slow sort-out continues, I spotted the new and contented tenant in a box whose purpose or intended recipient has long vanished from Penny and my minds. As for men, the explorer was myself, wobbling up a ladder to the roof of our shed for some experimental high-level light trapping. Well, ten feet high, anyway. The results were unimpressive; the sparsest number of moths since back in March. Mind you, it was almost as cold as March last night so that may be the reason rather than the unusual location. I will try again in warmer times. Publishing weird photos such as these which such ease and lack of expense makes me marvel again at how far technoloogy has taken us in the last two or three decades. Can you imagine using the old methods of buying a 36-exposure film for £3 or £4, waiting first to finish it and then a week or so for the chemist to get it developed (another £5-£7), and finally sticking it in an album (further outlay of £3 or so) to be seen by...well, no-one much? As it happens, I can, because my 95-year-old mother-in-law who lives with us still uses film, thanks to postal suopply and development services which seem to be largely based in Lancashire. She, however, does not photograph moths. Yesterday's tribute to the robustness of moths in poor weather bears repetition today. By 9.30pm last night, the rain was drumming on the roof and I almost decided to switch the lamp off. I didn't, because I have been trapping rather perfunctorily in the last two weeks, and I'm glad that I took that decision because there were plenty of residents this morning. About 150 in fact, rather more than the previous night. Looking around the self-seeded marigolds next to the trap, I also saw a pleasantly large number of 'semi-residents', including the Poplar Hawk in fine condition which you can see in my first two pictures; at the top, in the background behind an Angle Shades whose rakish profile always catches my eye; and then in splendour on its own. Another marigold housed the Treble or Lesser Treble Bar above and a third had this lovely carpet moth; only a Common Marbled Carpet, I think, but patterned and coloured in a way so subtle and intricate that you can feast your eyes on it for ages. I've put in a bonus picture for you to do just this. As for the rest, assorted sorts of yellow underwing toppled the Flame Shoulders from top place in the numbers chart although the latter came a very respectable second. Also there: Spectacle, Green Carpet, Common Plume, Shuttle-shaped Dart and the various forms of annoyingly brown and grey rustics at which I've had by usual stab; confirmation or correction welcomed as ever. Moths are sturdy little creatures. It was extremely chilly for August last night but the trap was well-stocked. Here are some of its residents - nothing terribly exciting but a good range. There were well over 100 individual insects with Flame Shoulders still well ahead of the others in terms of numbers. Meanwhile, I am still very pleased about yesterday's Hummingbird Hawk moth even though it was dead when discovered. I hadn't read the entry on the species in the Moth Bible when I wrote the post, assuming that I already knew all that I needed to. This was complacent of me. When I turned to the entry over my morning tea today, I discovered that it contains another example of the authors' very rare excursions into whimsy and overt lightness of heart. The HH has a special section of its own called 'Folklore'. There may be more of these in the book but if so, I've not come across them yet. In the Hummingbird Hawk's, the 'apparent' practice in Malta and Italy of seeing the moth as a good omen is described along with the pleasant fact that the senior author (I'm not sure which one this is) saw a Hummingbird Hawk on the day of his daughter's birthday which also coincided with the birth of the book itself - indeed a happy day for all interested in the moths of the UK. Square Spot Rustic - is it worth two of its pal in my hand below? Finally it repeats an anecdote published endlessly on the web: that a 'swarm' of Hummingbird Hawk moths was seen speeding across the Channel to the UK on D-Day, the Allied invasion of Europe on 6 June 1944. And everyone who saw them is supposed to have survived. What a nice addendum to all the history and drama of the day; but I would like to trace the story back further if anyone knows more. Were they hastening to our island to spread the news? Was the magical preservation actually the fact that if you did see them but then, alas, die, you were in no position to comment? Pondering such questions is the very stuff of retirement. Rosy Rustic, I think. Update: but I think wrongly. It's a Six-striped Rustic, new to my records. Very many thanks to Countryside Tales and Richard in Comments. Not sure - homework for later Update: it's another Square Spot - many thanks again to Richard in Comments.